Renesas DevCon, Orange County, California—October 22, 2012—IAR Systems® announced that benchmarks presented by the Embedded Microprocessor Benchmark Consortium (EEMBC®) show that the Renesas Electronics RX600 series of microcontrollers (MCU) together with the IAR Embedded Workbench® development tool suite provides faster performing code than ever before, achieving a score of 3.12 CoreMarks/MHz on the industry-standard EEMBC CoreMark® benchmark. The CoreMark benchmarks were run on an RX62N MCU. Based on Renesas’ high-performance RX core, the RX62N MCU is part of the wider RX600 series, which includes devices from 32KB up to 2MB of on-board flash and numerous variants, featuring a comprehensive set of on-chip communications and control functions. The RX62N and RX63N groups, for instance, include Ethernet, USB 2.0 (host and device) and CAN, and meet the connectivity needs of industrial applications such as building management and factory automation systems within smaller form-factor, cost-effective devices. All RX600 devices deliver the same cutting-edge performance, thanks to the RX core operating from its 0 wait state flash up to 100MHz. The latest version of IAR Embedded Workbench for RX, released in June 2012, included major enhancements to the already very efficient code optimization techniques. Now, the techniques have been even-further refined. The optimizations for code size and execution speed provided by the IAR C/C++ Compiler® perform on multiple levels, global as well as core/target-specific. The developer is able to tune the optimizations to achieve the best possible configuration for the application at hand. Major functions of the optimizer, such as loop unrolling and function inlining, can be controlled individually, and by setting different optimizations for different parts of the code, the right balance between size and speed can be achieved. IAR Embedded Workbench features multi-file compilation, which allows the optimizer to operate on a larger set of code and can result in smaller code, and linker-level removal of unused code. 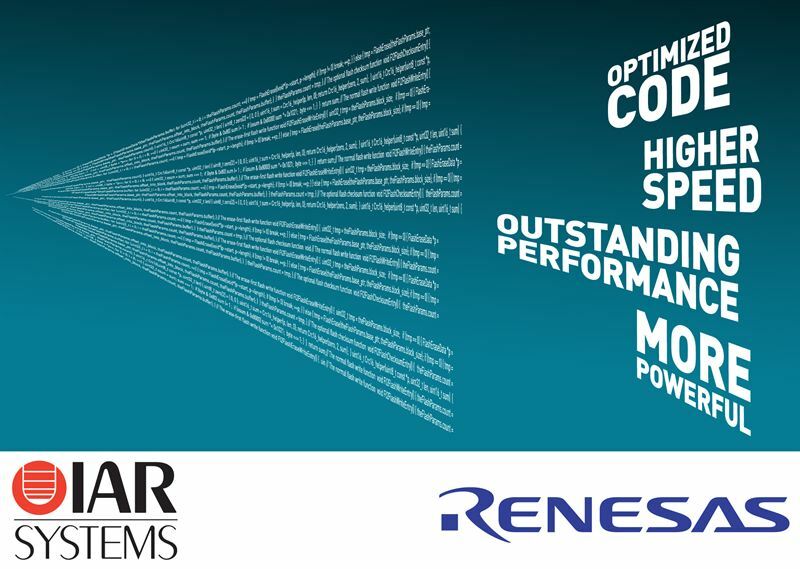 IAR Systems is the only tool vendor to provide high-performing tools for the entire line-up of Renesas MCUs. In total, more than 4000 Renesas devices are supported by IAR Embedded Workbench, including all RX devices. The scores were achieved using a pre-release of the upcoming version, 2.41, that will be made available to customers in November. IAR Embedded Workbench is a full set of development tools for building and debugging embedded applications. It includes a project manager, editor, compiler, assembler, linker, debugger and library tools in a user-friendly integrated development environment. More information about IAR Embedded Workbench for Renesas RX family of MCUs is available at www.iar.com/ewrx . CoreMark was developed by EEMBC, a non-profit industry association for embedded microprocessor benchmarks. CoreMark is a simple, yet sophisticated, benchmark that is designed specifically to test the functionality of a processor core. Running CoreMark produces a single-number score, allowing users to make quick comparisons between processors. CoreMark scores are published at www.coremark.org. Editor's Note: IAR Systems, IAR Embedded Workbench, C-SPY, visualSTATE, The Code to Success, IAR KickStart Kit, I-jet, IAR and the logotype of IAR Systems are trademarks or registered trademarks owned by IAR Systems AB. All other products are trademarks of their respective owners.